Will the Stepcraft Laser DL445 attachment give off fumes when in use? Yes, since it is essentially burning through the workpiece, some fumes will be produced. However, the system includes a built in exhaust extraction system with a fine particle filter to reduce the breathable fumes. It is recommended that you connect the output of the exhaust system to the outside of your work environment using flexible hose or PVC pipe (sold separately). This will ensure that the fumes are exhausted outside and not within the room your are working in. What software do I need if I want to use the Laser Attachment with my STEPCRAFT? The STEPCRAFT CNC comes with UCCNC machine control software, which also has a plug in that will transform a bitmap image into G Code for use with the Laser so you can laser engrave a photo or other bitmap image. 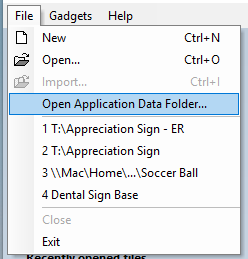 However, if you wish to use the laser to cut projects out, then you need a CAM program like Vectric Cut 2D or V Carve to make the tool path for the laser to follow and then output the G Code for UCCNC to read. What is the wattage of your Laser and how does it compare to a typical laser cutter? The laser is 2 watts. 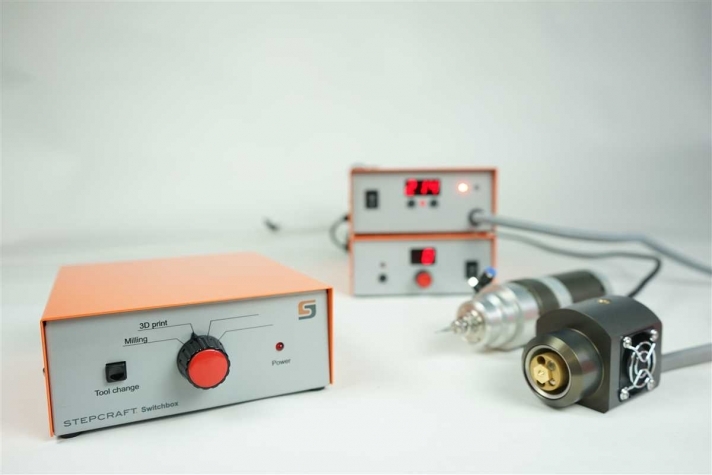 This is a different type of laser than the more common CO2 laser machines. CO2 Lasers tend to be more powerful, but also larger and consume more power. CO2 lasers need to be fully enclosed because the laser is generated from a large glass laser tube that is fixed on the back of the machine. The beam is then directed via mirrors to the laser head where it is focused and sent to cut/engrave the material. The laser tubes on these machines get very hot and require external water cooling. 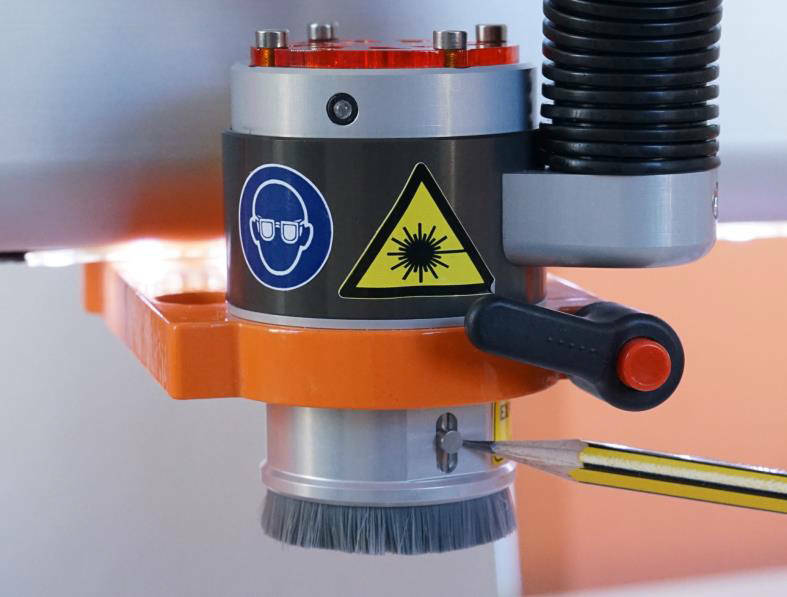 The STEPCRAFT laser is a solid state design which uses a laser diode (blue beam) that runs through a focusing lens and sent to the work material. While a 2 Watt laser does not sound as impressive as a 50 or 100 watt CO2, it is still surprisingly functional with the capability to cut through thinner materials (1/8″ or less wood and plastic) as well as a wide variety of engraving tasks. The STEPCRAFT CNC machine can not use a CO2 laser design because it is an open gantry machine and bouncing a laser beam around would be very dangerous. The Laser attachment will give you a lot of flexibility at a small fraction of the cost. 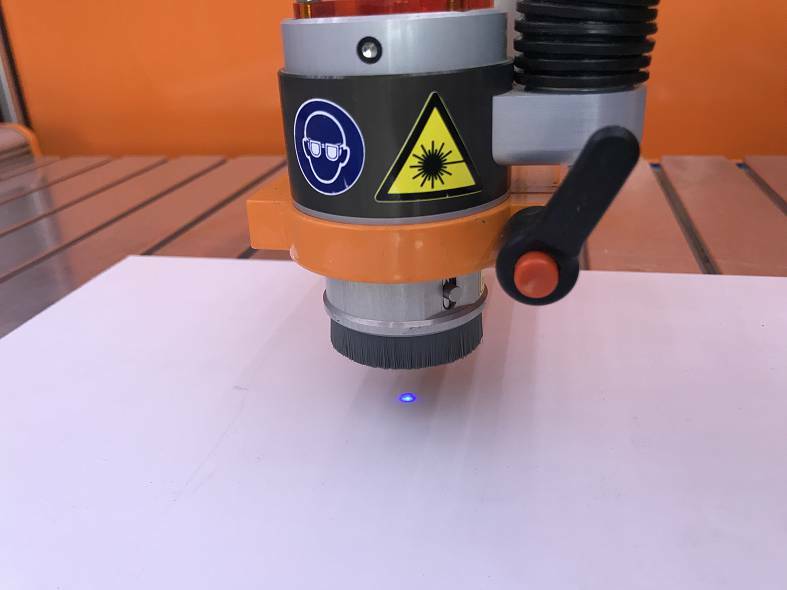 The laser diode is contained right in the laser head and there are a lot of safety measures that have been designed into the product to ensure that you can have maximum flexibility on a CNC router.